SCUOLE, ASSOCIAZIONI, SENIOR, GRUPPI GIOVANILI… COMPLETATE LA VOSTRA GIORNATA CON ALTRE ATTIVITA’! Essential symbol of Brussels and Belgium. Surrealistic visit through tubes, spheres and sound & light installations. Breathtaking 360° panoramic view on Brussels (92m). Panoramic Restaurant (95m). Permanent exhibition dedicated to the history of the Atomium and Expo 58. 2018 temporary exhibition dedicated to René Magritte, the most famous Belgian surrealist artist. Birthday action “60 years of the Atomium”: the entrance ticket automatically includes the entrance to the ADAM (Brussels Design Museum, located at 150m). Established after the Atomium’s acquisition of the Plasticarium collection in December 2014, the ADAM offers an innovative and surprising insight on plastic design from the fifties to the present (permanent exhibition / Plasticarium) and on other forms of design through other periods, expressions, materials and themes (temporary exhibitions). The ADAM, it is also an auditorium with about 400 seats and an educational and cultural service with activities designed for children, teens and school groups. Lectures and screenings, in connection with the themes that are explored, enrich the museum’s program of activities. Through exhibitions, guided tours, workshops and lectures, the ADAM aims to ensure that design is intelligible to one and all. The project is built with 10 principles in mind such as: making best use of the existing qualities, outside and inside; organising functions around existing structures; a simple, adaptable and reliable exhibition system; integrating stock into the exhibition; conceptual links between the objects; standard simple materials to let the colourful collection stand out. The Planetarium (of the Royal Observatory of Belgium) – Will welcome you to a completely redesigned projection hall, with a state-of-the-art projection system made up of eight of the latest technology video-projectors providing coverage for the entire dome which is 23 meters in diameter. The visitor will thus be immersed in a fascinating image projected on the dome covering 840m². Furthermore, thanks to an astronomy database containing more than 100.000 stars, it’s possible to travel among the planets, to fly above Mars or even approach the rings of Saturn! And why would we stop there? Do you dare to go beyond the limits of the solar system? Even the Milky way! Would you be tempted to explore the extremities of the Universe? Schaerbeek station is situated in the middle of the Belgian railway network. Based in the heart of Europe, it lies on the route of Belgium’s very first railway track, between Brussels and Mechelen. It is a true gem in Belgian railway architecture. The railway garden connects it with a new industrial hangar. Together with this new museum complex in the form of a saw tooth shape, the Schaerbeek station represents a wonderful symbiosis of old and new in the Art Nouveau heart of Schaerbeek. You are most welcome to visit both stations, whose plans date from 1887 and 1913, and which have been completely restored. Each time you’ll immediately see how the station architecture meets the new needs of its passengers. Find out how the mythical train was, and remains, an inspiration for many film-makers, artists and writers. And discover more about life behind the ticket counter. As in days gone by you can still enjoy a snack in the old station restaurant. Near the Basilica, the Belgian Chocolate Village (BCV) is, with more than 900 m², one of the largest museums dedicated to chocolate. The scenographic tour displays and explains the stages of the manufacture of chocolate, its uses, its history, its benefits, its economy and its diversity. It appeals to all the visitor’s senses while a tropical greenhouse reproduces the conditions of cocoa cultivation. Thanks to the chocolate workshop integrated in the museum tour you experience the daily work of the artisan chocolate makers who let you taste their last creations. Planète Chocolat is a Belgian artisan chocolatier located in the heart of Brussels close to the famous Manneken-Pis and the Grand-Place. The chocolate has been made in the traditional style of yesteryear since 1991 by a team of chocolate lovers playing with their creativity to fuse the great taste of Belgian chocolate into new forms. Planète Chocolat’s ambition is to preserve the role of art in food, an art form which is ephemeral but continually being reproduced. The medium itself, chocolate, enjoys an image which is both prestigious and Belgian. We felt this should also be true of the shape. So we decided to get Belgian artists to design our chocolates, artists representing very diverse artistic trends. These little pieces of Belgian chocolate thus become ambassadors for Belgium abroad. Is the best chocolate Belgian? Probably. Is the best chocolate art? Definitely. Chips, beer and chocolates… surely there is more to Belgium than that? Democracy, prosperity, solidarity, pluralism, migration, languages and Europe: these are the themes used by the BELvue Museum to help you to discover Belgium. Each one is developed through present-day testimonials and then traced right through history. This is a modern, original way of gaining a fuller understanding of modern-day Belgium. Have a look at the gallery too: there are more than 200 objects to view, each one forming a tangible memory of Belgium. Here are just a few examples: a lithograph by Magritte, a motorcycle, crystal vases by Val Saint-Lambert, and a football signed by the Red Devils. The very essence of Belgian-ness! Choco-Story Brussels is the result of an encounter between two families who were passionate about the world of cocoa and chocolate. The Van Lierde – Draps family, who created the Brussels Museum of Cocoa and Chocolate in 1998. Peggy Van Lierde, the only daughter of the founder of the museum, took over its running in 2007. In 2014 more than 75,000 people visited the Brussels Museum of Cocoa and Chocolate. The Van Belle family, who created not only Choco-Story in Bruges in 2004, but the Chocolate Museums in Paris, Prague and Mexico. Eddy Van Belle and his sons Cedric and Kevy all share this passion for cocoa and chocolate and have collected many unique objects from all over the world. As the visitor walks through the different exhibition rooms, he can learn the history of this precious commodity, from its origins to its transformation as a finished product. Samples of chocolate can be tasted during the visit and you can watch a demonstration given by our master chocolate-maker. Visitors are free to wander around the museum on their own or accompanied by a guide. Discover Brussels in a unique way with our red double deckers : the most easy and adorable way to visit the city. City Sightseeing Brussels : 360° panoramic view guaranteed. Live your greatest city trip with the 24u of 48u Hop On Hop Off tickets. Hop On where you want and when you want, Hop Off à volonté when you feel the need to jump off. It is possible on one of our 2 different lines travelling their own routes. You will nose out the main attractions and sights of the city. Audio guides available. Cantillon? That’s the time machine. You’ll leave the modern civilization, goodbye to the noise, goodbye to the world. “But where are we?”, you will ask yourself. Well, you are in a family brewery where Lambic, Gueuze, Faro and Kriek are made and where nothing has changed since 1900 when it was founded. The Van Roy-Cantillon family welcomes you and invites you to discover a fabulous world. Beers, tools and brewing process are still the same as in the beginning. Red copper containers, barrels, some of them more than 100 years old, and walls of bottles constitute the scenery for your visit. Maybe you’ll be lucky to see the brewing or the bottling, maybe you’ll see how barrels are cleaned or how fruit beers are made in summer. Maybe you’ll be lucky to see the brewing or the bottling, maybe you’ll see how barrels are cleaned or how fruit beers are made in summer. Anyway, you’ll be able to taste a real traditional Gueuze-Lambic and if you would like to know more about the Kriek or the Framboise, just ask the brewer. The Museum is home to the largest Dinosaur Gallery in Europe. We display T.Rex, Triceratops, Diplodocus, Stegosaurus, Maisasaur, Cryolophosaurus and many more. We also have the pride of Belgium, the original fossils from our enormous collection of Iguanodons. But there is much more to see. Such as the brand new Mosasaur Hall, these water-dwelling counterparts of the dinosaurs, the Gallery of the Evolution, BiodiverCITY, 250 Years of Natural Sciences… And our extraordinary Gallery of Humankind! Guided tours, on request. Handheld multimedia guides accompany visitors to the heart of the European Parliament, explaining the path towards European integration, how the European Parliament works and what its Members are doing to meet the challenges of today. The Parlamentarium is dynamic and interactive by design and can be experienced in any of the European Union’s 24 official languages, making it the perfect place for visitors of all ages to discover European politics. The Parlamentarium is open seven days a week and entrance is free of charge. A visit normally takes around 90 minutes, but shorter tours are available for families and school groups. Advance booking is possible for all, but strongly recommended for groups. See below for more details on what the Parlamentarium has to offer and its programme of events and temporary exhibitions. Admission is free of charge. All our dayprograms are adjustable to your wishes. Do not hesitate to contact us for changes or personnalisations. 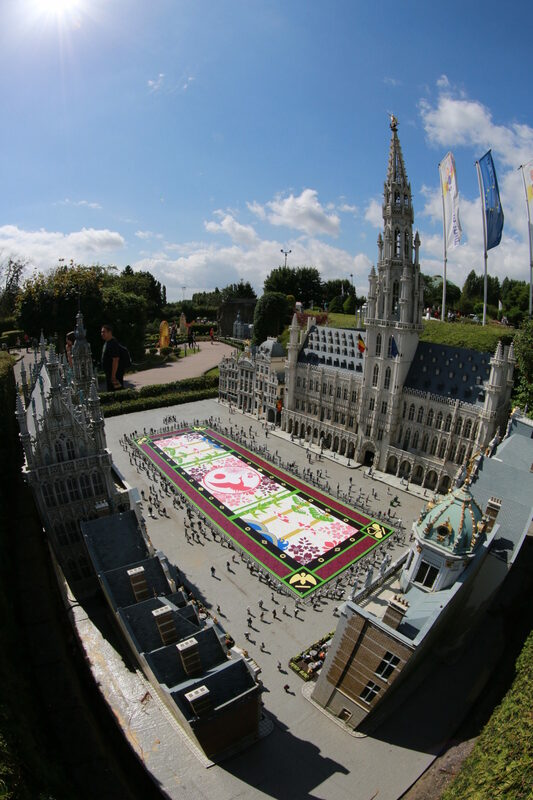 10h00: Free visit of Mini-Europe. 12h00: Lunch (please find our menus here). Planète Chocolat or Choco Story Brussels. Visit of the city by coach, with guide. 16h30: Free visit (on foot) of the Grand Place and surroundings. This program doesn’t include transportation fees (+ child rate available).